Gabriel Weinberg participated in an Q&A session at Hacker News this week where one person expressed concern that DuckDuckGo could disappear if it doesn't make money. In response, Weinberg explained that the company is already profitable —and took a shot at search giant Google in the process. "It is a myth that you need to track people to make money in Web search," he said. "Most of the money is still made without tracking people by showing you ads based on your keyword, i.e. type in car and get a car ad. "These ads are lucrative because people have buying intent. All that tracking is for the rest of the Internet without this search intent, and that's why you're tracked across the Internet with those same ads." Google remains the default search engine on Apple's Safari browser, but starting with iOS 8, the company began offering a new built-in alternative with DuckDuckGo. Other options in Safari are Yahoo and Bing. 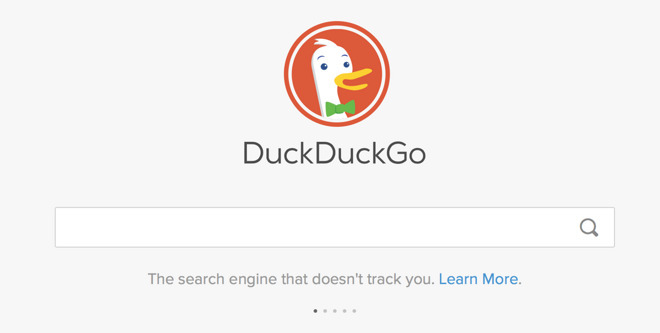 To change your default search provided to DuckDuckGo on iPhone or iPad, open the iOS Settings application and choose Safari, then Search Engine. Though Google is still the out-of-the-box option for Safari, Apple has switched to Microsoft's Bing for queries returned through Siri, as well as Spotlight search on both iOS and OS X. "There are still no good limits on online tracking and as a result it continues to get crazier and crazier and more people are reacting," he said. "It was already heading in that direction pre-Snowden."